Categories: AGM Series 5, Batteries, Renewable Energy. Tags: 12V, AGM, Deep Cycle, Renewable Energy, Rolls, Series 5. Deep cycle refers to applications that typically discharge 60-80% of the battery capacity. The Rolls Series 5 S12-160 AGM Deep Cycle AGM battery features thick plates with a high density active material. This design allows for reserve energy to be stored deep within the battery plates and released during slow discharge. The Rolls AGM range are sealed, non hazardous and completely maintenance free and will suit the customer looking for a long reliable, maintenance free service life. Rolls has designed a Deep Cycle VRLA battery with high reserve capacity, long cycle life and low internal resistance, while achieving superior cranking performance. 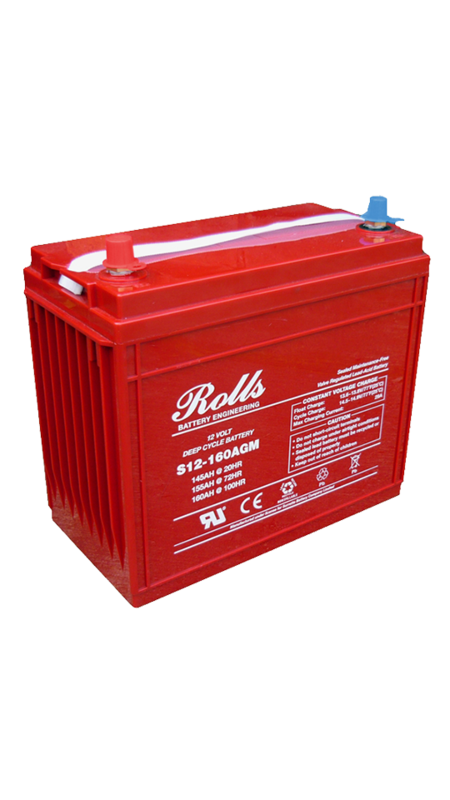 Rolls AGM batteries are the smart choice for demanding renewable applications. They are designed and built differently than standard batteries. They use more lead, heavier plates and other proprietary materials that enable them to deliver more power and capacity over many life cycles.